4 piece lot - Red Auburn, Golden Girl, Carmel, and Flaxen! 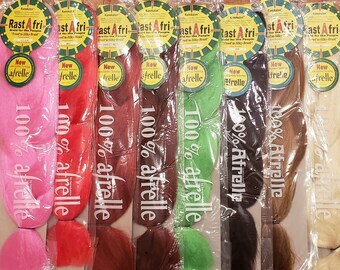 Doctored Locks brand high quality advanced KK fiber hair is super soft on your hands and comes in a gorgeous new array of colors! This professional hair 24+ inches folded lays out to 48+ inches when unfolded. This hair is heat sensitive to steam, boiling water, flat iron, or a hairdryer. Some colors may vary on the degree of heat needed and may require high heat! Making hair falls and extensions; dreads, curly dreads, braids, twists, curls, waves, wigs. I got all the colors listed and hope to have a successful first attempt at colored box braids without having to hunt down a bunch of colors lol thank you! The shipping was fast and I liked the delivery. Exactly what I needed to repair my vintage lamp! it now looks as good as NEW! I had been living with the shade all crooked for 10 years because I couldn't figure out what to use to fix it-- this is THE STUFF! We currently accept various payment types through Etsy including credit cards. Gift certificates are available upon request. All custom orders must be paid for before before we will start an order. Custom orders have separate processing times than the rest of the in stock items in our shop. Please contact us if you need a rush order or a custom order by a certain date. All orders in the state of Ohio will be charged a 7.5% sales tax. Once payment has been received you cannot cancel your order, so please order carefully. Once payment has been received you cannot cancel, change, or return your order, so please order carefully. If you have purchased a DIY supply item, or any item that is not considered a hairpiece or custom order, I will accept exchanges for unopened items. You are responsible for all shipping costs involved with your exchange. Please contact us if you want to exchange an item. If need an order rushed please contact us with the item you would like to purchase and the date you would like that item in hands. Otherwise, we cannot guarantee expedited processing to compliment USPS Priority or Express shipping methods. We are not responsible for any customs fees or taxes you may incur when receiving a package from us. Every country is different regarding how they handle incoming packages from other countries and there is no way for us to predict or prevent additional fees, taxes, or delays due to customs/your country's import laws. We are not responsible for lost, stolen, or damaged etc. packages once your order has been shipped out. Insurance is available for purchase during checkout if you wish to insure your package for the full item amount. All shipping costs include a small handling fee to cover packing supplies. All custom orders will receive consultation via Etsy conversations before you order. All custom orders will receive a customized reserved listing with details you agree to. We are happy to show you images of previous works to base your custom order on. If you do not like our portfolio of work, please do not order! No refunds or changes can be made to an order after an order has been placed, so please order carefully. No returns will be accepted for any custom order. We do offer bulk discounts on some items, please email us if you would like to purchase in bulk.